Hello my friends! Boy this weekend sure has flown by rather quickly for me but it has been a productive weekend. I was able to spend a good amount of time in my craft room working on challenges, Christmas cards and projects. 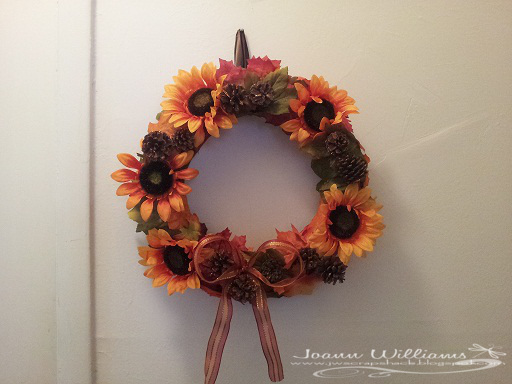 I did manage to take a break from "Christmas" for a little bit to find time to make a fall wreath that I have been wanting to make. About 3 weeks ago I was in WalMart and they had a great sale on wreaths and fall decor. This is what set my mind on wanting to make wreaths. These wreaths were $2 so I picked up two of them, one to make for now and one to do for Christmas time. 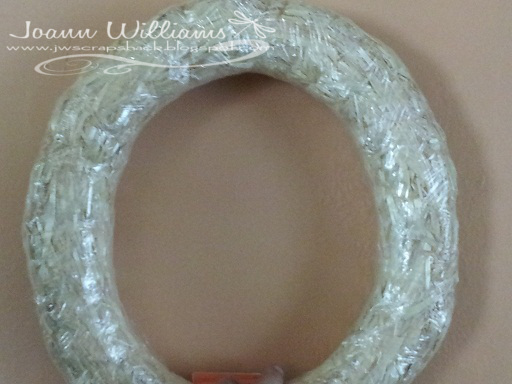 So here is what the wreath looked like before I started working on it. This wreath cost me about $8 to make! I am very happy and pleased with how this turned out. I have this hanging in my living room above my television. It looks so pretty!! I cannot wait to start working on my Christmas wreath. Well thats it for now and I want to say thank you for stopping by today. I hope you have a great Sunday afternoon as I will be watching some football and catching up on school work. Amazing! You did a wonderful job. I bought some mini wreaths in the bins up front at Target. I'm thinking about making one for Christmas. Very pretty JO! Love the flowers, its a great Autumn project. Lovely wreath, Joann. Sunflowers are my happy flower!